In an effort to reach all 4-year-olds in the Tulsa area who need to be enrolled in pre-K, ImpactTulsa is launching a new outreach program where trained parents knock on doors where there is historically low pre-K enrollment. Children who attend pre-K outperform those who do not. Kids who have pre-K as a foundation achieve more at every stage along the education continuum. To ensure all kids have the opportunity to achieve, ImpactTulsa is committed to the goal of increasing pre-K enrollment in the Tulsa area – and we are seeing success! Since 2013, enrollment in pre-K programs in the Tulsa area has increased from 69 to 72 percent. We’re moving the needle, but that’s not enough. We know we are still missing children who should be enrolled in pre-K. Our research shows one in three Tulsa-area 4-year-olds are not enrolled in pre-K. That’s more than 3,000 students who are not benefiting from quality, free educational opportunities. ImpactTulsa launched a strategy this year to reach the zip codes in the Tulsa area where there is historically low 4-year-old pre-K enrollment. We’ve hit the pavement to knock on doors and meet kiddos and their parents and grandparents in an effort to educate them about the importance of pre-K and enroll them on the spot. This parent advocate initiative kicked off in the spring of 2018, and we’ve met with people who were not previously reached through other approaches. 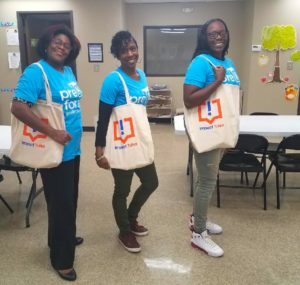 “The parent advocates are a wonderful example of how ImpactTulsa is pivoting and thinking creatively about creating communication channels to reach people where they are,” said Kathy Seibold, ImpactTulsa executive director. “Many of the families we meet when we knock on doors didn’t realize that a quality, free pre-K education was available – and beneficial – for their child. We’ve signed kids up on the spot, and we’ve supported many more by providing information and resources needed for them to move forward in enrollment.” The parent advocates receive extensive training and information to hand out to all interested parents or guardians. They learned how best to canvas neighborhoods and received talking points about the benefits of pre-K and techniques to help them succeed. ImpactTulsa is always is looking for ways to reach our community members, including bringing on new parent advocates. If you are interested in learning more, call 918-271-5054.